Yikes, I’m already ready for Friday. I feel like I’ve been spending too much time catching up on housework that I didn’t get to over the weekend. I need to stop messing up my kitchen so much. Yeah, that’s not gonna happen! Anyway, welcome back to tempeh week! 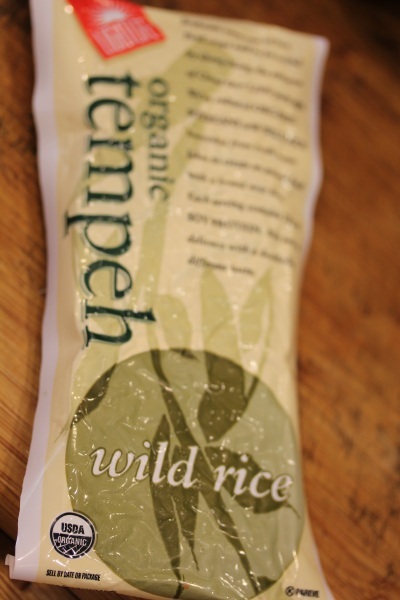 :-) Tonight’s tempeh is Lightlife’s Organic Wild Rice. 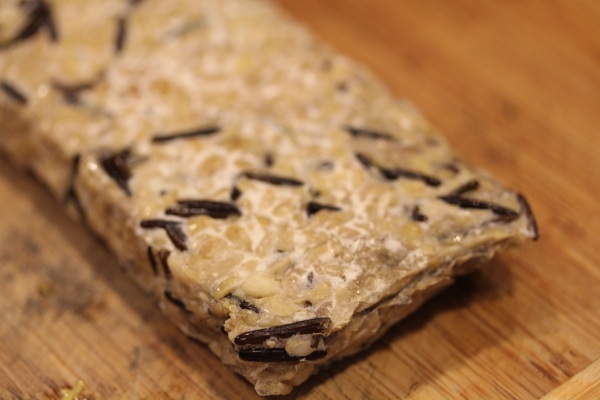 The texture on this flavor is considerably different from other varieties I’ve tried with large, wild rice grains distributed throughout the tempeh. 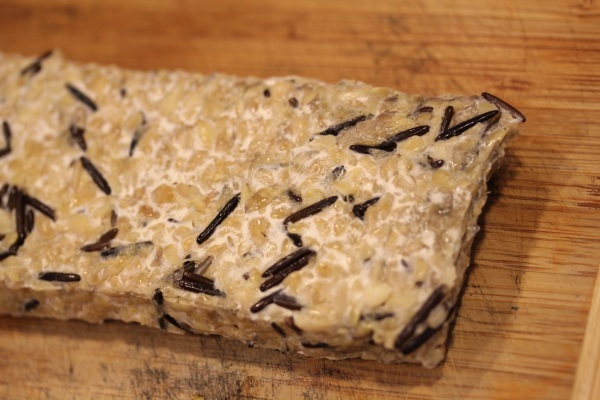 They add visually appealing color and break up the thick, caked texture plain tempeh can have. Since the weather is is finally spring like in the 80s and sunny, I decided on a summer-themed recipe to try with this. Mix all ingredients except tempeh in a large bowl. 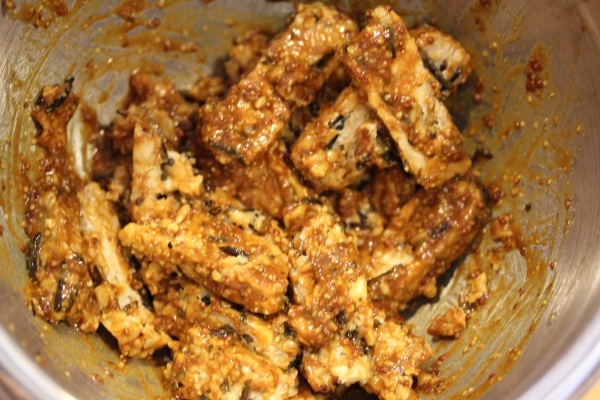 Add tempeh strips to bowl and toss to fully coat with sauce. Fry strips stovetop over medium/high heat for 5 minutes. Flip strips and fry for another 5 minutes. Then serve. Makes 2 servings. 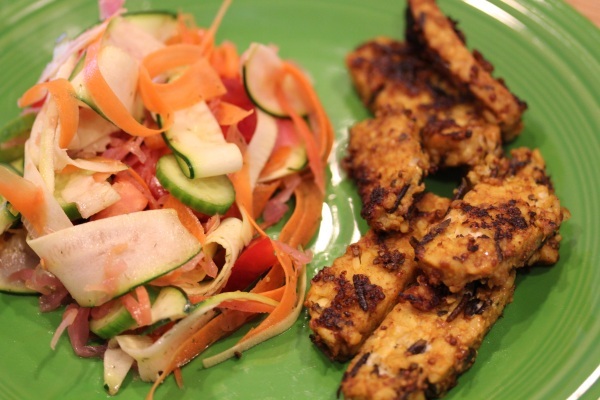 Because of the large rice grains in this tempeh flavor, the strips crumbled more while tossing making this flavor a little harder to chop up into a neat form and grill. Not a big deal and the Wild Rice variety would work great as a meat alternative in spaghetti sauces or crumbled over salads. 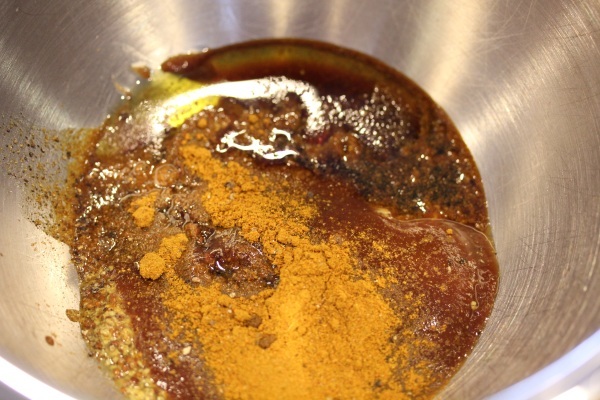 While frying, they made the kitchen smell wonderful, a mix of curry and a summer BBQ. 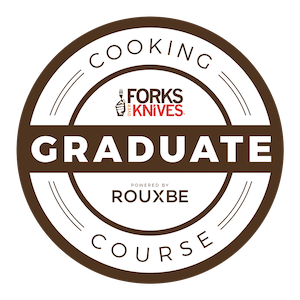 I served the strips with a simple salad of carrots, zucchini, cultured veggies, cucumber, tomato and dressed with Meyer lemon oil and dried dill – simple, fresh, and delicious. Dare I say the strips had a very meat-like texture? They could easily substitute chicken tenders and the slight sweetness in the sauce and fun finger food form would probably be a hit with kids. 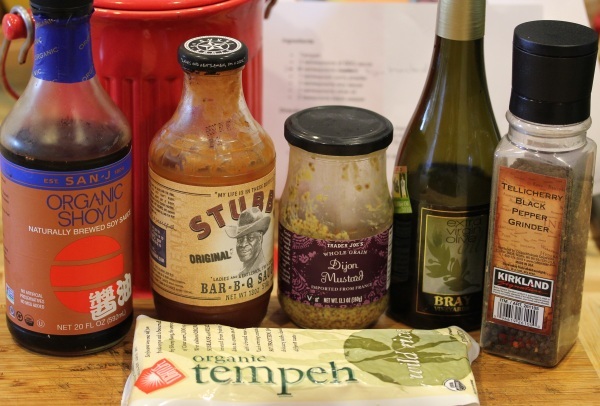 You could also grill larger tempeh chunks or “steaks” coated with this sauce for a grilling out option. I’m already ready for Friday = my entire week has felt off b/c i got home from aruba and went back to work on a friday last week and everything just seems surreal this week. You’re the tempeh master :-) Looks great!! 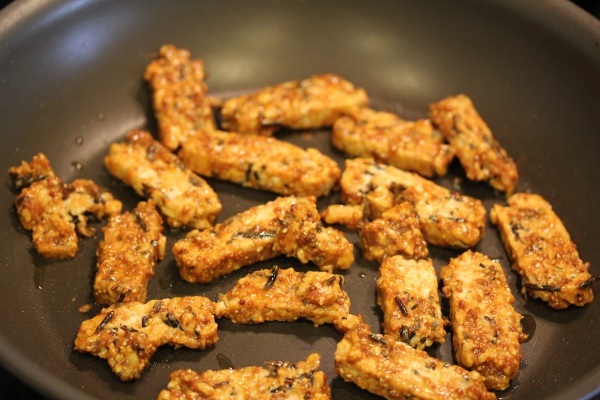 wow i am drooling over this tempeh and it is 6am…..i think i could eat it for breakfast! Don’t be scared, it’s awesome! It has a nutty and hearty flavor that’s fast and easy to cook or crumple over a salad. 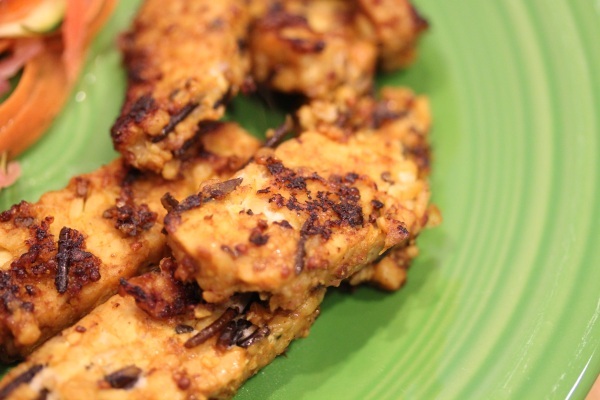 Girl you make tempeh look sooo soooo good! I just found out that my grocery store doesn’t carry it! but i’m moving soon… to a bigger and better grocery store and town. thank. goodness. Bummer about the grocery store! The regular grocery stores here have it in the health food section and charge way too much for it. Trader Joe’s and Whole Foods are the best places to get it.